In recent years, as a consequence of the EU Paediatric Regulation (EC1901/2006 and EC1902/2006) and the US requirement for inclusion of Paediatric Investigation Plans (PIP) in all new Marketing Authorisations, Almac has experienced a significant increase in client demand for development and commercialization of paediatric dosage forms. Click here to view our latest resources on Paediatrics. Oral liquid in bottle formulations. 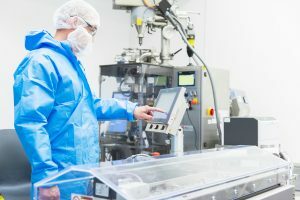 Almac’s expertise extends to commercial manufacturing of these often small scale/low volume products coupled to our ability to offer innovative packaging solutions particularly suited for Paediatric medicines. Providing these services from a single site assures our clients that the formulation and processing knowledge gained throughout development phase is effectively transferred to ongoing Commercial supply. Almac offers flexibility of scale for its commercial clients, manufacturing and packing commercial products with batch sizes ranging from 5kg up to 2.5 tonnes. As a trusted commercial partner for some of the world’s leading orphan drugs Almac has demonstrated a strong track record in continued successful delivery of low volume/high value products through flexible, innovative packaging solutions particularly suited to paediatric and niche medicines. Pack design and artwork management - Complementing our processing capabilities, and with access to the most up to date design hardware and software, our dedicated in-house packaging and design team is able to provide a full suite of design services to meet your requirements for Paediatric packaging. Product Launch Expertise – Almac is the industry leader for orphan drug launch and distribution in Europe, having successfully supported the launch of 15 first in class, innovative orphan drugs in the last 3 years. Capital Projects - Almac has a leading reputation for delivering complex, time sensitive capital projects, in support of growing innovative products. We have recently invested in the addition of a Merz stickpack line which is a fully automated forming, filling and sealing machine, capable of filling 80 stick-packs/minute offering an ideal solution for paediatric packaging.